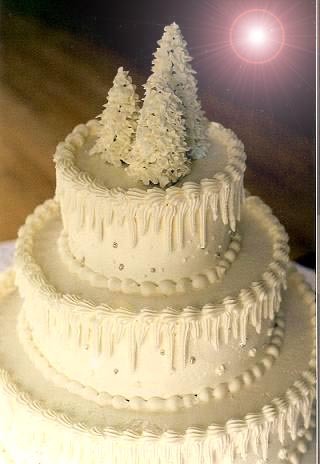 Christmas wedding cakes for winter brides and festive Christmas cake decorating ideas for bakers, pastry chefs and decorators. Winter wedding cakes are so much fun to create. Fluffy white frosting is reminiscent of snow. Add generous amounts of glitter, greenery, ribbons and bows and you will have the perfect Christmas confection. 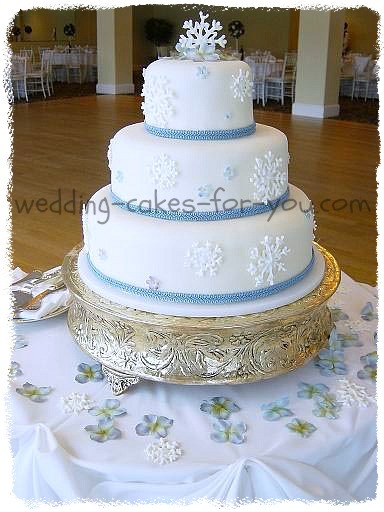 Snowflake wedding cakes are popular choices for winter wedding cakes and Christmas wedding cakes too. 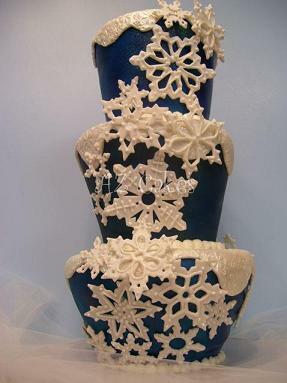 Snowflakes are often made of royal icing and fondant or gumpaste. You can read about Gale's creation and how she made this gorgeous three tiered Christmas Eve winter fantasy confection by clicking on the photo. Ice cream cones covered in royal icing (recipe for royal icing) are what I used to make the topper for this simple wedding cake. The icicles on the sides are piped buttercream frosting with silver dragees added for a little extra sparkle. Glass tree ornaments make beautiful decorations on the table and even on the cake itself. Use fresh pine cones and greenery such as Holly around the base of the cake. Royal icing can be piped into snowflake patterns on waxed paper, sprinkle with edible glitter and let dry for extra sparkle. 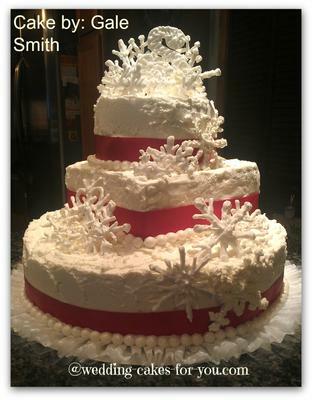 See the Snowflake cake example above. 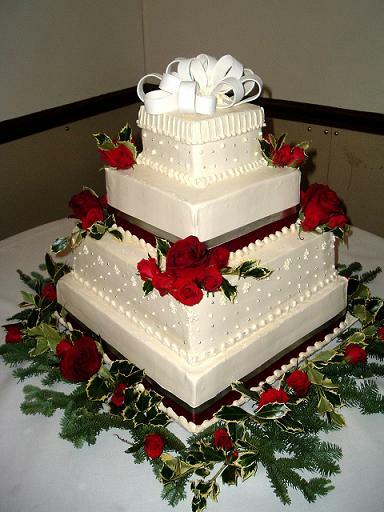 Red or white roses and rose petals are gorgeous on Christmas or winter wedding cakes. The butter cream beauties below are simply decorated in uttercream dots and swirls with ribbon. 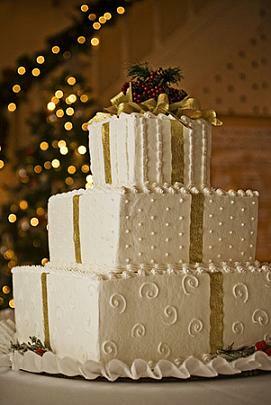 Square cakes, reminiscent of gift packages, are perfect for a Christmas wedding cake. Click to Enlarge. photo courtesy of Budget Dream Weddings. This yummy package is topped off with pine cones and greenery to give it a splash of color. Gold dragees would be a nice addition to this cake. Another square shaped Christmas wedding cake, this one with loads of fresh greenery and red accents. 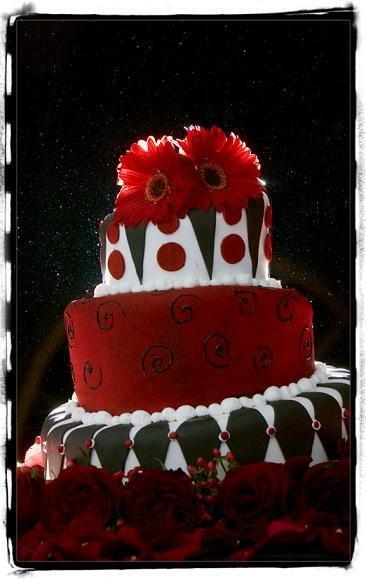 The topper is a simple fondant or gumpaste ribbon and the sides of the cake are piped with swiss dots. 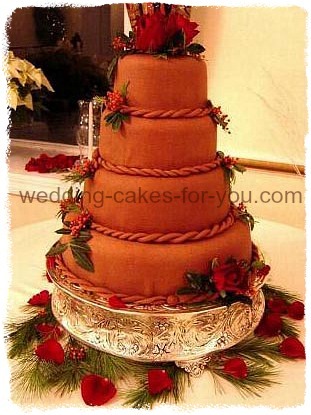 The whimsical cake above is enrobed in a variety of rich colored fondant. Topped with Gerbera daisy's and surrounded by a bed of red roses, this topsy turvy cake is a gorgeous winter wedding cake. This design would be appropriate for a black and white theme as well. 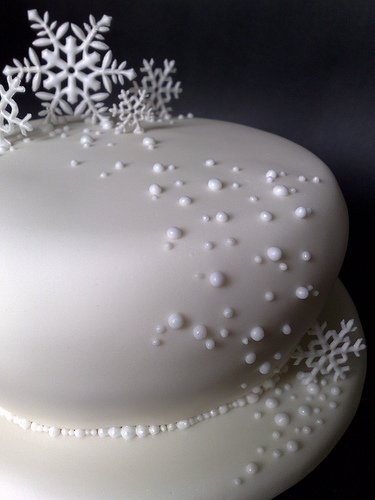 A topsy turvy design with snowflakes that have been pressed out with gumpaste. This gorgeous example above has a sparkly blue fondant with gum paste or fondant snowflakes and snow drifts. The contrast of the deep blue and the white decoration is striking. The chocolate Christmas Wedding Cakes? Sure why not. This one works well with the red petals, holly berries and a rope border. Fresh flowers and greenery give it the finishing touch. If you love chocolate this is a great way to show it! See how the snowflakes are made. There are quite a few Christmas and Winter wedding ideas right here on this website for you. Browse these other information packed pages and see what you can find. Videos are included for all of the recipes and ideas so you can follow along.